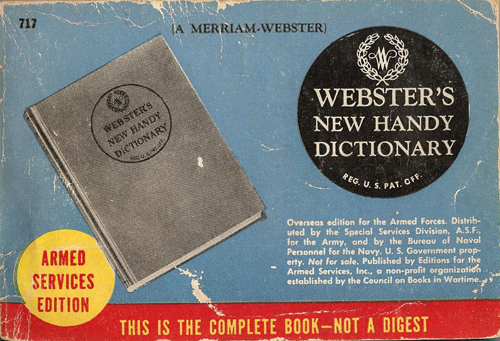 Title page from Webster's New Handy Dictionary, Armed Service Edition 717, printed 1945. In early August I received an email from Brian Anderson, asking me about the above page scan. Anderson is a collector of the WWII era Armed Services Editions. 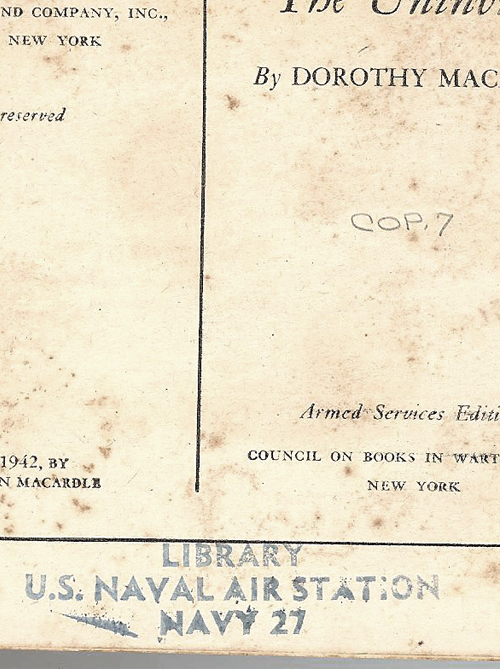 These were cheap paperbacks distributed to the troops for recreational reading during the war. This particular ASE had an interesting unit insignia stamped on the inside. It turns out the book was part of the library of the 13th Major Port, a unit to which my grandfather's battalion was attached during service in Antwerp, Belgium. 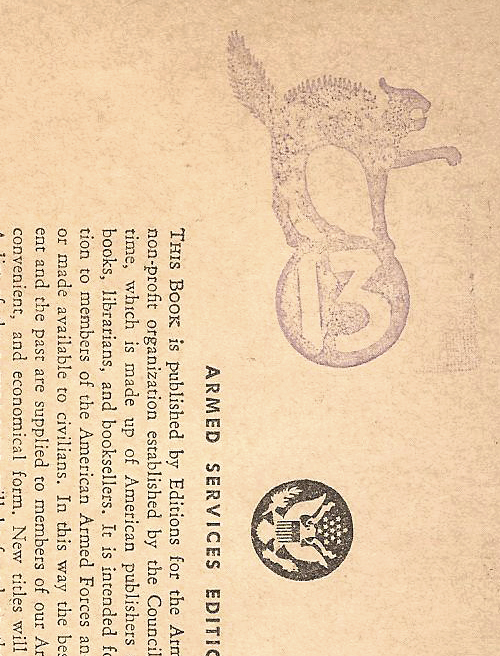 The cover of the Armed Services Edition book that has the above 13th Major Port cat stamp. I was happy to be able to confirm what unit the cat/13 insignia came from, and I was very interested to hear about Anderson's collection. 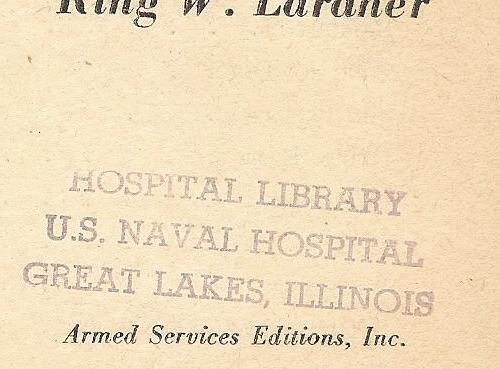 He has multiple books with stamps which show they were held in the libraries of army bases, hospitals, and naval ships. I thought it would be cool to post them here. While the other stamps lack a stylish graphic, the variety of rubber stamp typography is interesting for a designer like me to see. 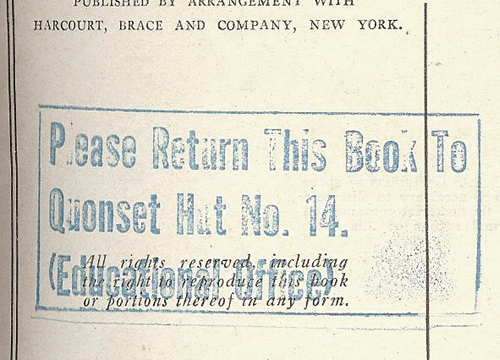 The stamps also provide a little bit of context into the book's life, that would otherwise be lacking. For instance, one of these stamps says "U.S.S. Ranger Library". It's fascinating to know that this copy of A. Wolcott: His Life and His World was read by sailors who were aboard the aircraft carrier that took part in Operation Torch, the Allied invasion of North Africa. 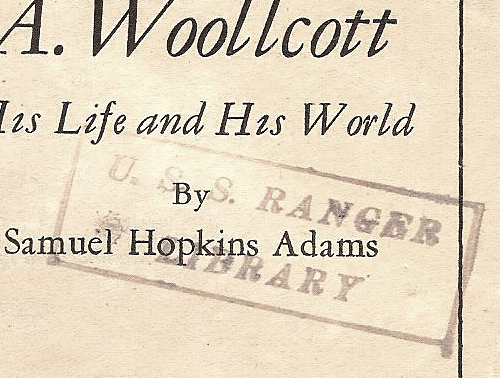 Title page of A. Wolcott: His Life and His World. ASE 931, printed 1945. 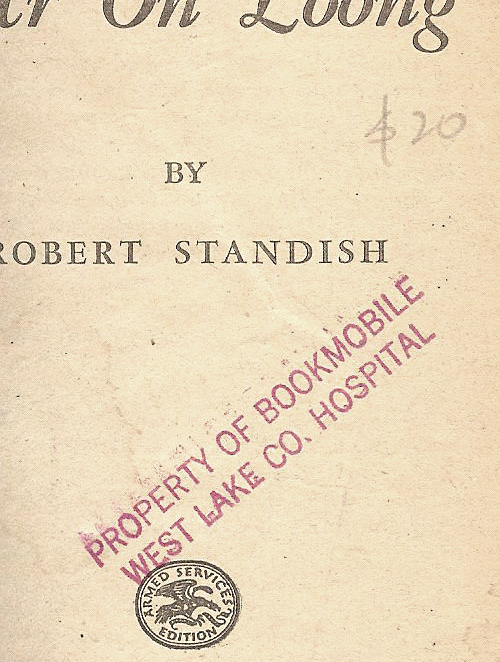 Title page of Mr. On Loong by Robert Standish. ASE 1281, printed 1947. 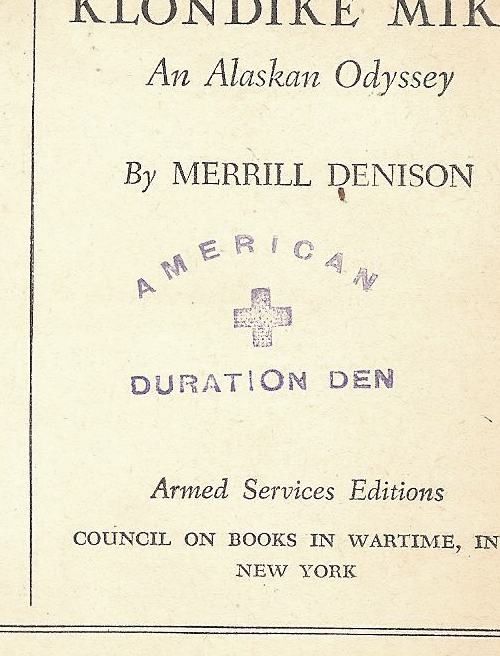 Title page of Klondike Mike by Merrill Denison. ASE B-58, printed 1943. Title page of The Uninvited by Dorothy Macardle. ASE B-51, printed 1943. 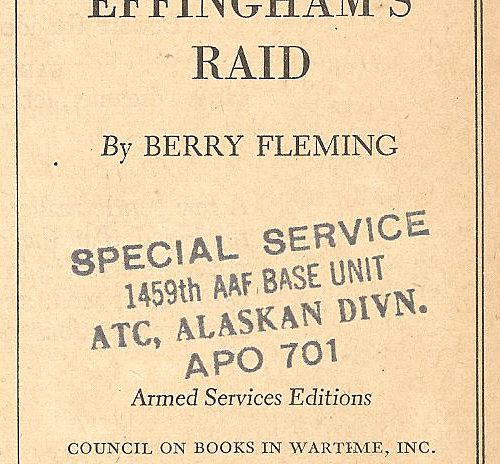 Title page of Colonel Effingham's Raid by Berry Fleming, ASE D-095, printed 1943. Title page of Deep River by Henrietta Buckmaster. ASE R-39, printed 1945. Title Page of Round Up by Ring Lardner. 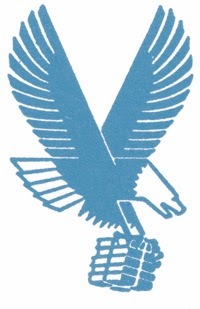 ASE F-172, printed 1944. Title page of Mr. Winkle Goes to War by Theodore Pratt. ASE A-07, printed 1943. Beautiful stuff. 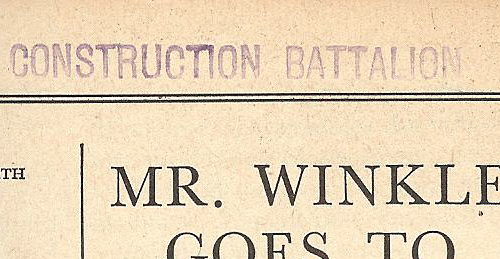 so much history in every stamping and letterform—and even the yellowed paper. That freaky cat is a riot! i just found a bokk like the one in the picture in my attic (in Austria) It belonged to the former owners, a lady who worked for Hitler in Berchtesgarden Germany under WWII. Does these books have a value or are the mass produced? HI Stinne, These Armed Services Editions vary in value. 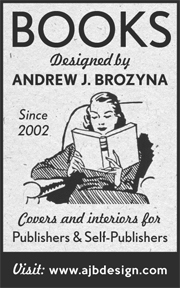 Millions of copies were published, but some titles have survived more often than others. You should look on eBay to see prices. 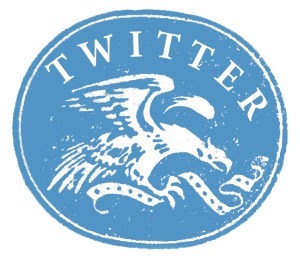 Im looking for an ASE book, 1214 Under the Red Sea Sun. Does anyone know where I can get a copy?